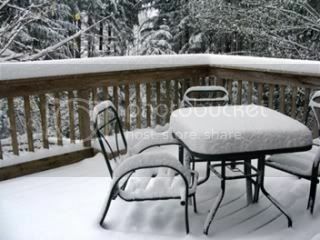 Winter is upon us already-- not what we like here on the West Coast (unless it's on a mountain)! On the weekend I pulled out my old cooking notebooks. I have ten that I kept from 1996 through mid-2008, handwritten, and full of recipes I was working on, menus we enjoyed or that I planned, my thoughts and opinions on all things culinary, recipes I wanted to try, food science tidbits, quotes from authors, etc.. It was quite interesting reading through the first two and I'm going to keep going, and perhaps share some things on this blog. I realize that blogging sort of takes the place of the notebooks now, but not entirely, and I should really start one up again. 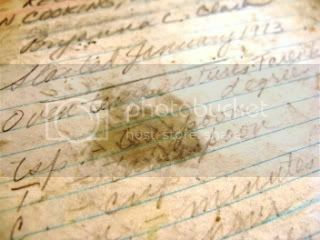 Writing by hand is a totally different experience, and those thoughts and recipes aren't lost inside of a hard drive. 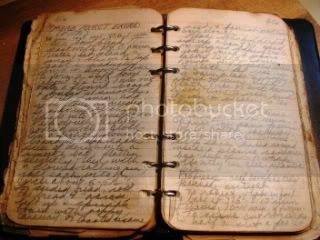 I can pull the notebooks out and bring back memories of many meals, experiences and milestones in my life. But I still have one more that predates those nine-- one started in January of 1973, when I was a young mother of 3 and we were embarking on crazy homesteading adventures! Here are some photos of the pages, all stained and, yes, actually yellowing! It's written in pencil and is full of the recipes I used regularly, with some nutrition info of the times (protein was all-important!). I can see that I was flirting with vegetarianism at the time, but it took me awhile to get there! One of the recipes I made frequently in those days (it was quick, cheap, and good with the soups, bean pots and stews we often had) was biscuits. The one I liked in those days was adapted from the old Tassajara Bread Book . It contained eggs, though. Over the years that I have been a vegan (about 22 now) I have tried and developed many biscuit recipes. I have made them with Earth Balance and oil, low-fat, high-fat, even no-fat! But, these days, we only have biscuits a few times a year and I make a veganized traditional biscuit. Too much fat for our usual diet, but an occasional guilty pleasure! But I thought that I'd make a batch to go with the stew we brought to have dinner with friends. (Actually, my post on guilty pleasures prompted me to make them this time!) We had leftovers with marmalade! So here is my current favorite-- NOT low-fat, but worth the occasional foray down memory lane! 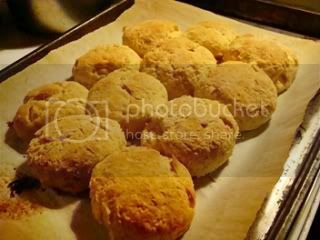 UPDATE: Here is my latest biscuit recipe from May 2012. It utilizes sifted whole grain flour and homemade baking powder. Place the biscuits close together (edges touching) on a small greased cookie sheet and bake about 12 minutes, or until golden brown. Serve hot! Leftovers can be warmed in a toaster oven. Your notebooks look like art. They're great. I'm excited for the biscuit recipe. Thanks for sharing. I was amazed at the weather you're having!! I checked your area on WeatherUnderground and was even more shocked at the temperatures!! So cold! I even found a webcam right on Denman Island. Link is here. But, on to the subject of your post: I was so impressed at all the note taking you've done over the years, and keeping those notes!! What a treasure to go through in later years! Brenda, that webcam is courtesy of a vegan friend! The weather is crazy! In Toronto it's 15 degrees C above zero! Bryanna .. as small and "intimate" as Denman Island's population seems to be, I was curious if you knew whose webcam this was! How neat that not only do you know the folks, but that they are vegan as well! !